Disclaimer: Only true book fan can understand a few hidden jokes in this review. This is not a review, you animals! You anyway can’t read, can you? Okay, only a few, not all of you. 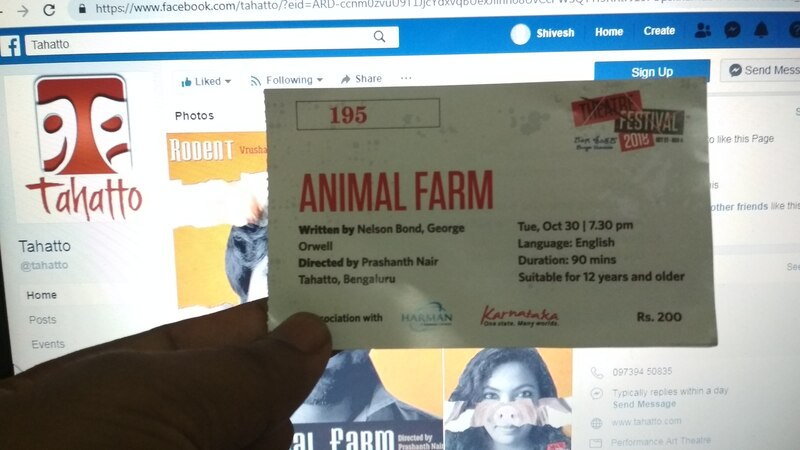 Today I watched this lovely play named Animal Farm based on the book by the same name. The play is performed by Tahatto theatre group in Bangalore. While watching the play, I suddenly realized once again that how different theatre watching experience can be – despite the fact that I am a theatre artist. Adapting a novel into 80-85 mins of play is close to impossible, especially when the novel is that popular. The play has caught the soul of the novel and presented in the rawest form possible which is not that easy considering the novel is neatly crafted with details of animal bonding, bureaucracy agenda, political plotting, the greed of power and love. It could capture all of it very well. The use of lighting and music placement with the chorus from the actors are well-managed and enhanced the emotion in the play. Kudos to their acute timings! Also, the set design team has transformed the stage like you are in a stable or any animal house. Good job there. However initially, the audiences, unfamiliar with the novel, may not identify with the characters but if they stick to it for a while, they can catch the story. They joined the strings with the narration which is effective. I really loved how a few moments of the play touched upon the current scenario of the country. Those remarks are well-placed and fit the story as well. Yes, you will find plenty of amusements and laughter moments too. When Boxer’s ribs got broken – A little confession – I dropped a few tears even while I was reading the novel. It gets me every time. Clover’s melancholic words while broken Boxer was lying on her lap. I am not going to give special remarks for the director as you already have read it above. 1) Even though I liked the ending with lost ideas of freedom and slavery, I would have loved to see the teaser of the real dream of animals – as if what would the animalism be like if their dream had come true. 2) Since I am a big fan of clown play – I would love to see the complete clownish version of this play. I recommend everyone to watch this play whenever it will be performed in the future. The play was performed in Ranga Shankara under their on-going theatre festival. There are lots of interesting plays you can watch. Check out their page and see which one you would like to watch.